Performers include: James Daly, Chad Everett, Audrey Totter, Jayne Meadows, Corinne Camacho, Chris Hutson, Fred Holliday, Jane Dulo, Barbara Baldavin, Virginia Hawkins, Eugene Peterson, Ed Hall, and Louise Fitch. This medical drama revolves around the lives and careers of two very talented surgeons and their patients at a university hospital in Los Angeles. Doctor Paul Lochner (James Daly) is the experienced, professional, and compassionate Chief of Staff. 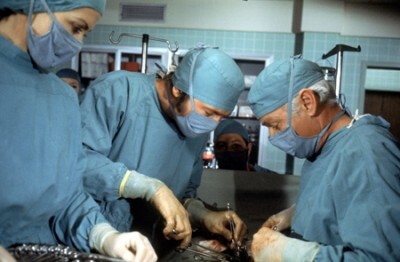 His close friend is Doctor Joe Gannon (Chad Everett), a young and handsome professor of surgery. Gannon also works as the head of the Student Health Department at the university since he can identify with the students. Though Lochner and Gannon respect each other’s abilities, they sometimes have different ways of approaching their patient work, setting up some youth vs. experience tension. They’re helped by a very efficient Head Nurse Eve Wilcox (Audrey Totter) and other recurring staff members like Nurse Chanbers (Jayne Meadows), Doctor Jeanne Bartlett (Corinne Camacho), Nurse Courtland (Chris Hutson), Doctor Barnes (Fred Holliday), Nurse Murphy (Jane Dulo), Nurse Holmby (Barbara Baldavin), Nurse Canford (Virginia Hawkins), Doctor Weller (Eugene Peterson), Doctor Bricker (Ed Hall), and Nurse Bascomb (Louise Fitch). A clinic that’s desperately needed is in danger of being closed when physicians refuse to turn over suspects in a street fight over to the authorities. First aired: March 15, 1976. We own the complete Medical Center series and enjoy it. However, we were intrigued by the lack of James Daly from season 3 on. The series finale and the third last episode appear to be attempts at spin offs. We were disappointed that Everett and Daly didn’t have chance to say goodbye. I watched Medical Center as a teen. I fell in love with the show, and Chad Everett! Series One has finally come out! Can’t wait for the rest of the series to come out on DVD! Please keep them coming!